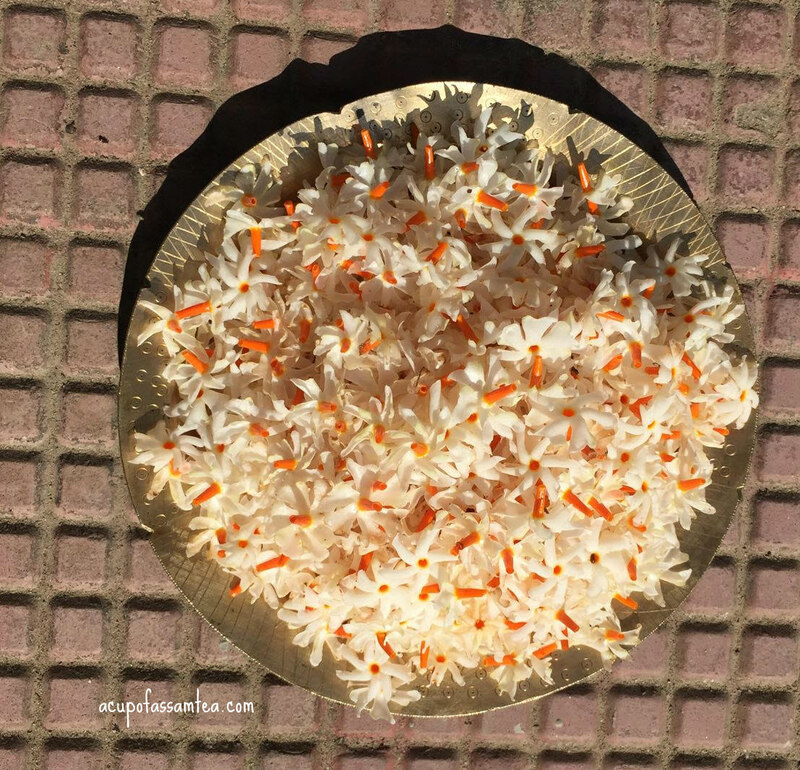 I find myself waking up and playing in the lawn in a beautiful fall morning or festive time in India making a flower garland with Sewali phool (night jasmine). Ah, nostalgia. During this time the weather is neither cold nor hot with fall flower endorsing the beginning of the festive season. Yes, I miss this not being there, yet I feel wonderful and fortunate to celebrate the festivity of the two culture and the two countries here. 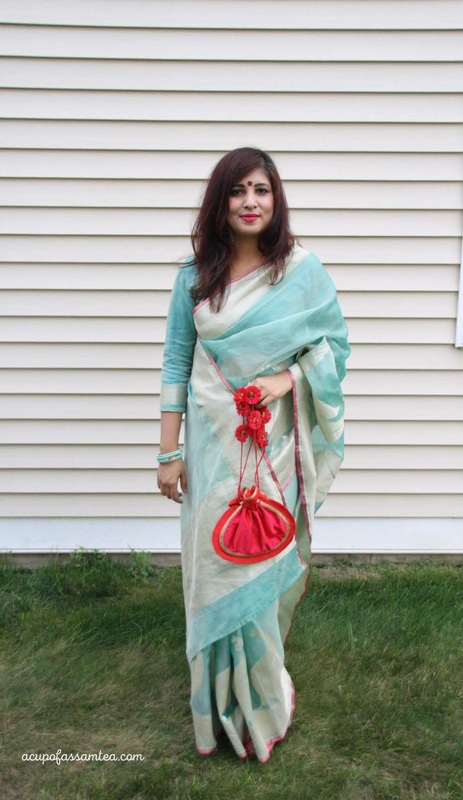 If you follow me or read my blog, then you might have seen the Indian festive look 1. Here I am sharing Indian festival look 2. 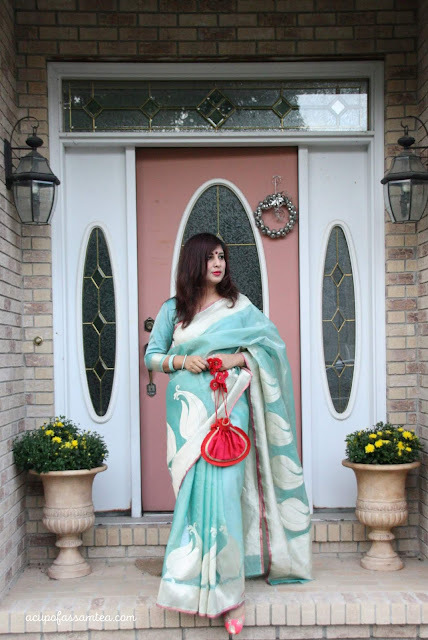 I love collecting sarees, while traveling to India I always pick up sarees. 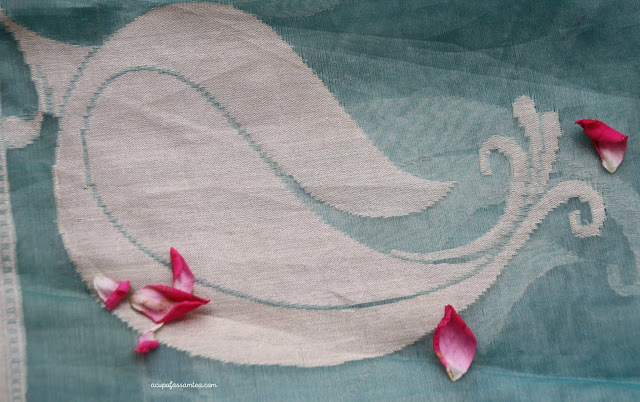 This saree is a couple of years back mint green silver and gold border with big parsley motifs and a hint of pink lining edge on the border. I kept it simple with a pink potli and ruby studded Jhumka earing and pink jutti (flat Indian pump) which I absolutely love and love even more because of the emerald green sole. A huge bindi, hair and makeup are neutral and natural except bright pink lips to perk up with pink potli, shoes and the edge of the saree. The look is meant to be simple, natural and Indian. I won't say it is completely traditional Indian, as it has a little modern touch and twists of course. Let me know your thoughts. Beautiful. Thank you very much for sharing this stunning look. Its nice to know about assam also. What a beautiful traditional dress love the colors. The red really makes everything stand out. Just beautiful. Oh how pretty! I love that it stands out because of the gorgeous color. I hope you had a good time. Oh wow what an absolutely beautiful looking dress! The colour is just gorgeous. I hope you have a lovely time at the festival. One thing I admire about Indian's dresses most of them looks fancy and colorful. I once attended a festival in Toronto Canada by the Toronto Island it was a fun event. I wish we could come and visit again. 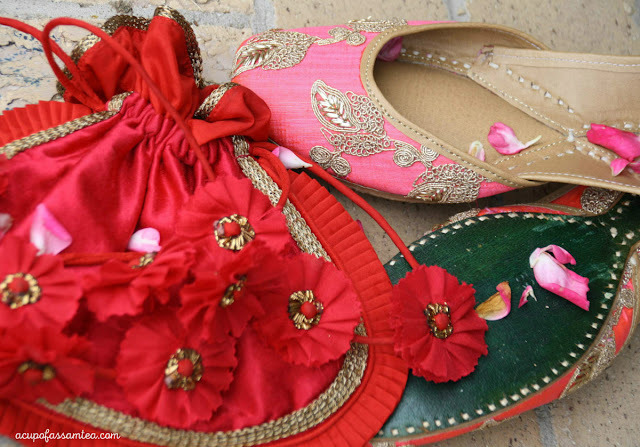 I have always liked Indian clothes because they are so colorful. You look absolutely gorgeous in this outfit. I'm not sure I could pull it off myself but I would definitely love to try. It is great that you embrace your culture so passionately and the saree is so festive. I like to think my culture has such great things too. I always admire how detailed Indian outfits are. There must be story in every design. That is such a beautiful, majestic look. I love the colors and material of that dress. It's truly enchanting. You look amazing! The colors are so pretty and the fabric choice is out of this would. So pretty and you look gorgeous. I love how refreshing the color is. It's lovely. It is also glamorous. I can see you going to a movie premier. Wow! Your festival outfit is just so stunning. So much attention to detail and beautiful colors. Your whole look is gorgeous!! I wish I ahd something with meaning like that to wear! This saree is absolutely breathtaking! The color is magnificent on you - you are glowing! I can totally see the modern-aspect of it, which I love. That dress is so gorgeous. I would love to experience wearing this Saree as well. Indeed a very detailed and nice Indian outfit. I really love this! It is so beautiful! I really love the dress, and just the whole overall look is gorgeous. That's such a beautiful festival look. I've always loved your traditional saree especially for special occasions because it's always so beautiful and colorful. This is perfect for festivals! Hi, I just wanted to tell you how beautiful you look and the Sari gorgeous!! Just love this post! !